Recent work by the Antikythera Mechanism Research Project (AMRP), a team composed of experts from Britain, Greece and the United States, has cast some fascinating light on the origins of the ancient machine. In July 2008, the science journal Nature published an important paper detailing tests carried out by the AMRP using 3-D X-ray scanners to examine the ancient device. On the back dials of the device the team found what they called the ‘Olympiad Dial’, a feature of the Antikythera mechanism dedicated to the four-year Olympiad Cycle of athletic games in ancient Greece. The AMRP team has also managed to decipher all the months on the Mechanism’s 19-year lunar calendar, and it is this important work that suggests an origin for the Antikythera Mechanism not in the eastern part of the Mediterranean but much further to the west. What the group discovered was that the month names used on the ancient device were linked with colonies established by the ancient Greek city-state of Corinth. These colonies were founded in North West Greece and Sicily. If this is the case then the connection with Archimedes at the Greek colony of Syracuse may well be relevant. Without doubt one of the most amazing and intriguing artefacts of the ancient world, the original Antikythera Mechanism is currently on display in the Bronze collection of the National Archaeological Museum in Athens, accompanied by a reconstruction. There is also a replica of the ancient device displayed at the American Computer Museum in Bozeman, Montana. 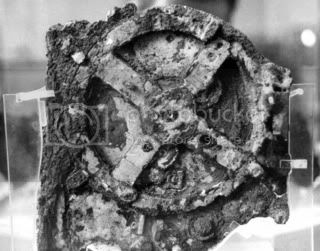 The discovery of the Antikythera Mechanism has challenged our perception of the scientific and technological capabilities of the ancient world in no uncertain terms. Reconstructions have proved that the design functions as an astronomical computer, and show that the scientists of the ancient Greek and Roman world of the 1st century BC were perfectly capable of designing and building complicated mechanisms which would not be equalled for a thousand years. Derek De Solla Price commented that the civilisation who possessed the technology and the know how to construct such a mechanism ‘could have built almost anything they wanted to’. Unfortunately most of what they created has not survived. Nevertheless, modern scientists believe that the Antikythera Device was too sophisticated to have been a unique device, so the possibility that there may be more examples of these ancient mechanical computers out there cannot be entirely discounted. De Solla Price, D. Gears from the Greeks: The Antikythera Mechanism—A Calendar Computer from ca. 80 B.C. Science History Publications. 1975. Freeth, T. (2009). “Decoding an Ancient Computer”. Scientific American 301 (6): 76–83. James, P. & Thorpe, N. Ancient Inventions. Michael O’Mara Books Ltd. 1994. Marchant, Jo (2009). Decoding the Heavens: Solving the Mystery of the World’s First Computer. Da Capo Press. Powered by WordPress v 4.9.10. Page in 0.244 seconds.